:From the engagement ring to years after the wedding ring, every season of a marriage requires renewed commitment, fresh perspective, and practical Biblical wisdom. 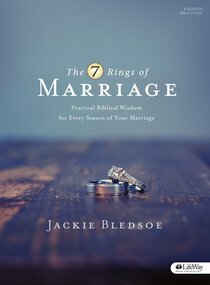 Each of the 7 "rings" outlined in this study will teach couples to view their marriage with the end in mind, ultimately leading to a lasting and fulfilling relationship in every stage of marriage. The 7 Rings include: Engagement RING (The Beginning), Wedding RING (The Commitment), DiscoveRING (The Real You), PerseveRING (The Work), RestoRING (The Fixing), ProspeRING (The Goal), and MentoRING (The Payback). (8 sessions) Features: Personal study segments to complete between group sessions 8-session study with 7 weeks of homework Weekly date ideas and conversation starters to fuel connection with your spouse Optional trade book for extra reading-available separately Benefits: Discover the covenant you made and live out your calling as a couple Invest in your relationship with your spouse while growing in your relationship with Christ Equip yourself to thrive in each new stage of marriage Dig deeper into Scripture and your marriage relationship alongside other couples-encouraging, supporting, and learning together as a community Author Bio: Jackie Bledsoe is a professional blogger, author, and speaker, but first and foremost a husband and father who encourages men to better lead and love their families. He's the author of The 7 Rings of Marriage™ book (B&H Publishing) and Bible study (LifeWay), and with his wife, co-hosts The 7 Rings of Marriage™ Show, where they share practical marriage lessons and interview other couples who have lasting and fulfilling marriages. Learn more at JackieBledsoe.com. About "The 7 Rings of Marriage (Bible Study Book: 8 Session-study And 7 Weeks Of Homework)"